Summary (Courtesy of Goodreads): Before Briony's stepmother died, she made sure Briony blamed herself for all the family's hardships. Now Briony has worn her guilt for so long it's become a second skin. She often escapes to the swamp, where she tells stories to the Old Ones, the spirits who haunt the marshes. But only witches can see the Old Ones, and in her village, witches are sentenced to death. Briony lives in fear her secret will be found out, even as she believes she deserves the worst kind of punishment. Then Eldric comes along with his golden lion eyes and mane of tawny hair. He's as natural as the sun, and treats her as if she's extraordinary. And everything starts to change. As many secrets as Briony has been holding, there are secrets even she doesn't know. So when I saw the cover of this one, I was a bit wary. Usually a really pretty cover means it contains an unsubstantial story, and I know you're not supposed to judge a book by it's cover and all, but really. I tend to shy away from glamorous cover models. However, this one was recommended to me by a very reliable source (Liesl Shurtliff, actually) so I decided to withhold judgment until after reading it. And in the end, I found it to be a breath-taking, addicting, fantastic story that I didn't want to end. I will caution, this book was disorienting at first. The narrative style is first person, but it's really unlike any other first person narration I've ever read. You get inside this girl's head, and it is very much a teenage girl's head: confused, insecure, full of undeserved self-loathing, jumbled, and barely coherent. It took me a few pages to wrap my head around this style that jumped from thought to thought with nary a segue in sight, but once I picked up on her voice, it was a totally enjoyable ride. It helped that Briony was such an interesting character in general, smart and witty (biting sarcasm) but deeply insecure and full of guilt. I'm not sure how Billingsley was able to so thoroughly capture the mind of a somewhat scarred teenager, but she did it brilliantly. Which leads me to the other characters, and my only complaint of the book. Except for her sister (who I'll get to in a minute), every other character was disappointingly underdeveloped. This is possibly a byproduct of the strange first person narration, but I felt like I hardly got to know, much less understand, any of the other characters. Particularly Eldric. I never felt like I really had a clear picture of him or his personality. Briony's father was practically a nonentity. The other townspeople were little more than names mentioned in passing. The only character where this lack of development made sense was the step-mother, and that was on purpose for the pivotal plot twist. But, like I said, this neglect of other characters may have been on purpose, since everything is filtered through Briony's very inwardly-focused mind. The one exception to this was Briony's sister, Rose. In modern medical terms, Rose would perhaps be labeled with some disorder on the autism spectrum, but in this time period (early 20th century) and setting (rural England) she is just a special, beautiful character whose tics and odd behaviors were simply presented and expected to be accepted. Briony's complicated relationship with Rose was also beautifully developed, with the deep love underlying the heavy sense of responsibility, guilt, and annoyance felt by Briony. It was a wonderful relationship. Now, a word about the setting. Early 20th century England where the Old Ones are real, magic exists alongside religion and industrial technology, and witches are still hanged? I loved it! Very creative and interesting place to put this story. Even though I didn't understand everything about how the Old Ones worked, I liked the world and the magical realism elements. And what is there to say about the plot? 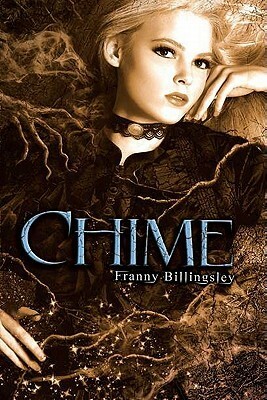 It is complicated, and deals with Briony working through issues relating to her step-mother's death a few months before, and trying to save the children of the village from the swamp cough, and maybe perhaps falling in love, although that only happens to normal girls and not witch girls like Briony. I don't want to say too much more about it, because I don't want to spoil anything for anyone. I want all my friends to go out and read this one because I think (hope) they will love it as much as I did. Yes, sure, it might be just another YA fantasy with a love triangle, but no, it's not just that. The way this character is presented, the way she thinks and feels, is so different for this genre that it makes this book stand out among the crowd. I thoroughly enjoyed the story, found it completely addicting (in a can't-put-down-this-book kind of way), and highly recommend this book to anyone who likes a good YA fantasy.